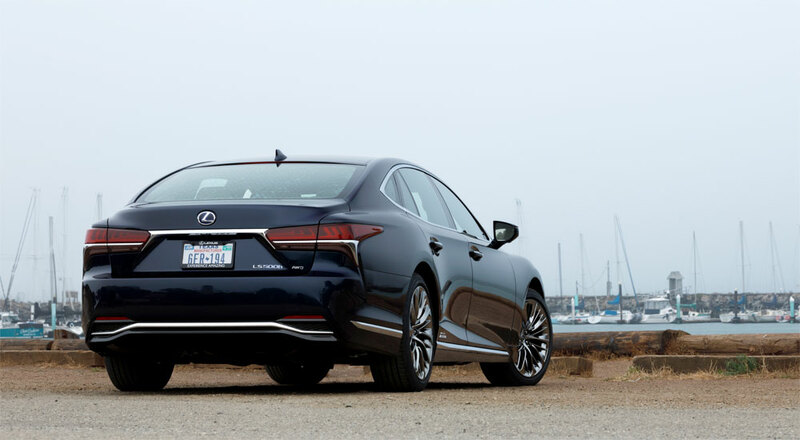 The [LS 500h] powertrain also boosts the Lexus curb weight to a porky 5,220 pounds, despite this being Lexus’s first lithium-ion battery hybrid system. The main electric motor emits a bothersome whine when the engine is shut down, and the car shudders when your right foot awakens those cylinders from their fuel-saving slumber. Ultimately, the hybrid system just doesn’t read as luxurious. And its intrusiveness—including the 3.5-liter V-6 that moans and moos in bovine fashion—is at odds with a flagship sedan that’s otherwise zen-like and naturally calming. If all this negativity is harshing your mellow, let me be clear: I suspect that, as with the LC coupe, this LS sedan will feel infinitely healthier with this hybrid tumor surgically removed and a thumping engine transplanted in its place—even if that’s the twin-turbo V-6, rather than the coupe’s naturally-aspirated V-8. That engine won’t solve the maddening puzzle of the Lexus Remote Touch interface, so if you dig the LS anyway, you’ll have to live with it.